Economic Expansion by State…How Much Has Your State Improved? U.S. real gross domestic product (GDP) measures the market value of all goods and services produced within an economy in a given time period. In 2010, the nation had a GDP of $14.5 trillion, an increase of approximately $5 billion from 2009, representing a 3.74 percent growth rate. According to the second estimate released by the Bureau of Economic Analysis, the GDP increased at an annual rate of 2.0 percent in the third quarter of 2011 over the previous quarter, showing continuous positive signs of improvement. 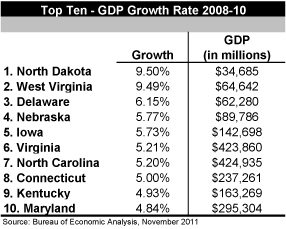 The top 10 states which experienced the most economic expansion from 2008 to 2010, as represented by GDP growth, is led by the state of North Dakota. While North Dakota had the highest growth in GDP at 9.5 percent, it had an aggregate GDP of only $34.7 million and ranked 49th overall in the nation. Virginia is the only state that ranks in the top 10 for aggregate GDP (rank 10), per capita GDP (rank 8), and the growth in GDP (rank 6). California has the highest aggregate GDP of $1.9 trillion but ranks 46th in GDP growth. Of the five states with the highest GDP, New York is the only state that also ranks in the top five for GDP per capita of $53,558. The United States GDP per capita stands at $37,867, according to the World Bank. Hawaii went from 10th in GDP per capita in 2009 to 19th in 2010. While 35 states had a negative growth rate from 2008 to 2009, all of the states had a positive growth rate from 2009 to 2010.